Joyce Glasser reviews The Eagle Huntress (December 16, 2016) Cert. U, 87 min. As far from post-truth American, Brexit Britain, brown leather trousers, and the slaughter in Aleppo as you can get, The Eagle Huntress is guaranteed to spread enough Christmas cheer to get you, and the whole family, through the holidays. This is not about hunting eagles, but hunting with an eagle – just don’t try it at home. You’d need physical strength; rock climbing skills; expertise and stamina on a horse; the ability to withstand temperatures of minus 40 for hours and to bond with wild eagles – for starters. 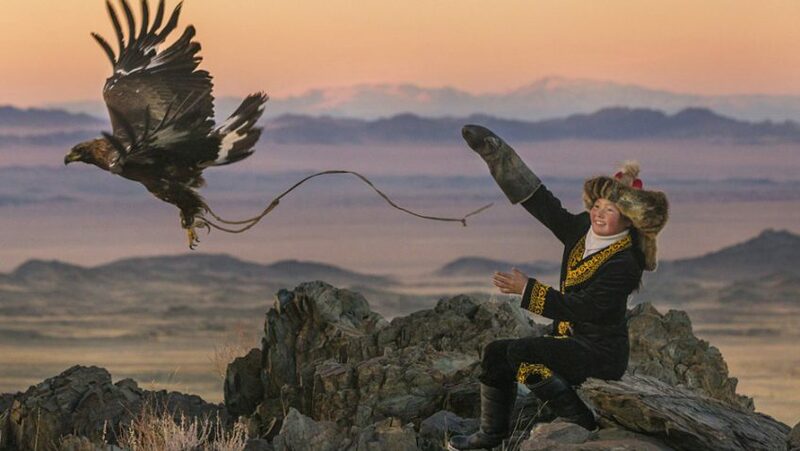 Almost unique to the Kazakh and Kyrgz people in Northwest Mongolia, rearing, training and hunting with golden eagles is a tradition that has been passed on from father to son for 12 generations in eagle Nurgaiv’s family. 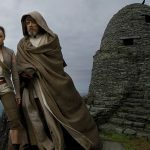 Now, his 13-year-old daughter Aisholpan is about to change all that. The story of how a British director with no experience making documentary features ended up in the remote Bayan-Ölgii province of Mongolia to make the film is a story in its own right. Bell was enchanted by a glorious photo he saw on the internet taken by Israeli photographer Asher Svidensky. A beaming young girl in traditional dress, proudly poses with a huge eagle on her arm on the top of a mountain. On the BBC website he read about Aisholpan, the trainee eagle huntress. 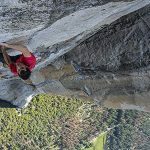 Unprepared, ill-equipped, but determined not to miss this momentous event, Bell takes us with them to film this unique sight that is even more dangerous for the crew than for Aisholpan. Only 1% of what they shot was usable, but it is breathtaking. And don’t worry: by tradition, the eagles are returned to the wild after seven years. Determined to follow Aisholpan as she begins the arduous path to becoming an official eagle huntress, Bell brought on board DOP Simon Niblett, who packed a home-made drone and a crane along with his Red One digital camera and suitcase. Aisholpan seems like an ordinary girl when we see her giggling in school where she boards, returning home on weekends, as the commute is too long. But even in school she is focused and excels as she plans to be a doctor. The weekends are devoted to bonding with her new bird, White Wings, and then training it for the annual Golden Eagle Festival in Ölgii, founded in 1999. Her father, Nurgaiv, won the competition twice, and Aisholpan has been his apprentice since she was ten. While many of this year’s 70 male contestants drive to the competition, Aisholpan and her father cannot afford that luxury. They spend a whole day in the saddle, the three-foot tall, 15-pound bird of prey perched on Aisholpan’s right arm. Her arm receives some support from a wooden stand, called a baldaq, attached to the saddle. Without rest, Aisholpan registers and awaits her turn. She is declared the youngest participant and the first female to enter the competition. One of the competitions requires the trainer to call its bird. 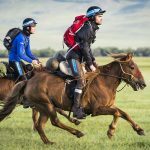 To remain on your horse after a 15 pound parcel comes hurling through the air at 150 miles-per-hour and lands on your arm, requires courage, trust and months of practice. The final stage of becoming an eagle huntress is indeed tough. Aisholpan takes White Wings to the frigid steppes to hunt. Winter is the best time because the foxes stand out against the snow. The scenery is gorgeous, but it is so cold that the camera crew can only film for short periods of time. The horses slide on the ice and then sink into the deep snow. For White Wings this is a new experience. After a long wait, a fox arrives, but the eagle, perhaps half frozen, is too slow. Aisholpan waits patiently, ice forming around her face. She is one determined girl. And this is one documentary with a feel-good factor that is off the charts.